Allow the veal spare ribs to defrost in the fridge for around six hours. Remove them from the fridge around half an hour before you’re ready to start to allow them to reach the right temperature. Then remove the veal spare ribs from the packaging and pat them dry. To make the barbecue sauce, first slice the chilli pepper into thin strips and then chop finely. Peel the cloves of garlic and chop them finely or crush them using a garlic press. Mix everything together with the rest of the ingredients. Season to taste with salt and pepper. 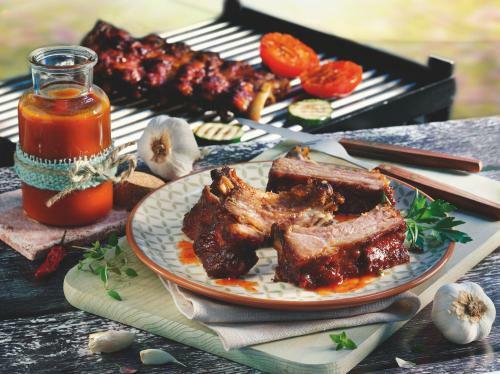 Place the veal spare ribs onto the barbecue (always use the indirect grilling technique). Ensure that the temperature inside the grill is maintained at a constant 150 to 160°C. The cooking time is approx. 30 minutes. Brush the top side of the veal spare ribs with a little red marinade approx. 5 minutes before they are done. Serve the barbecue sauce as a dip. Tip: Serve with fries, mashed potato or coleslaw.